Edena spoke of World War II and how they had to ration their items like sugar and gas. Elders who lived through the World War II era have a different perspective on life. During a recent visit to the Gila River Indian Community, we were honored to meet a few gifted Native American women who remembered how life was then. Edena and Ruhama were both working on holiday-themed crafts. We enjoyed visiting with them as they shared stories of Christmas past. Ruhama added that, back then, it was more important for people to be with their families than it was to give or receive gifts. She said that she wished people still focused on being with their families during holidays, instead of shopping. She also stated that it was good when their parents were still alive. They seemed to be the ones who brought their families together, especially during the holidays. Once they passed away, the kids seemed to scatter. Ruhama wished people still focused on being with their families during the holidays, instead of shopping. Edena was talking about the health screening that the Community Health Representative (CHR) program for the Gila River Indian Community had scheduled for the Elders later that day. As our Program Partner, they had requested Christmas stockings for one hundred Elders in their communities, so everyone would have a gift to look forward to receiving. They knew that not all Elders would attend and planned on delivering during home visits before the Christmas holiday. 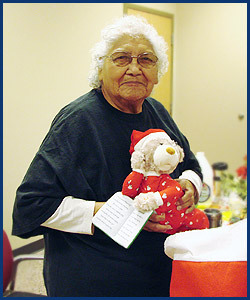 The program conducted home visits to homebound Elders, as well as hospital visits when requested. They also provided classes and served various generations, from newborn infants to Elders. 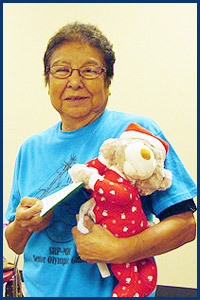 We were pleased to be in attendance while the Program Partner began distributing the stockings to those Elders present. Their stories and comments were a gift to a younger generation, reminding us how important it was to stay focused on people.